Savile Row is a typical central London street of fairly modest eighteenth-and nineteenth-century brick town houses mixed with late twentieth-century developments. It stretches from Vigo Street in the south to Conduit Street in the north, running parallel with Regent and New Bond Streets. Sitting at the heart of the city's West End luxury shopping district, the Row is particularly famous as the center of the British bespoke tailoring trade. The Row traces its beginnings back to the late seventeenth century when Richard Boyle, the first Earl of Burlington, acquired a mansion on nearby Piccadilly (now Burlington House, home of the Royal Academy). Burlington protected the privacy of his estate by buying up the surrounding land, which was eventually developed by his descendant, the enlightened third Earl from the 1730s on. Savile Row was one of the resulting streets of genteel residences, which were generally rented by members of the nobility and affluent professionals who formed part of the new fashionable trend for living "in town" during the social season. The aristocratic atmosphere of the Row was an important component of its rise as a center of style. Its residents required expensive and well-made goods that befitted their rank, and thus attracted the attention of manufacturers and traders in luxury commodities. The high proportion of top-rank military and medical men living in the district also ensured that the provision of smart uniforms and civilian suits were prominent in this commercial expansion. By the early nineteenth century, the Row had become synonymous with the London-based dandy craze, popularized by personalities such as Beau Brummel, and several ambitious tailors were establishing their reputations in nearby streets. Henry Creed and Meyer & Mortimer for example, were based in Conduit Street, with a rapidly expanding customer-base, thanks to the demand for uniforms initiated by the Napoleonic Wars. The first major incursion of tailoring into Savile Row itself was made by Henry Poole in the late 1840s. A few smaller tailors had opened workshops there in the 1820s, but Poole's were of a different order. They enjoyed the custom of high-profile clients, including royalty, statesmen, sporting stars, and literary and theatrical celebrities, and put unprecedented effort into the design of their showrooms and marketing ventures. Arguably it was Poole who established the international fame of the Row as a "Mecca" for men's fashion (though like most tailors he also fitted women with riding outfits and "tailor-mades"). Through the remainder of the Victorian age and into the twentieth-century, Savile Row shifted its character from that of a residential enclave to a thriving street of tailoring concerns. Distancing themselves from the sweated trades that were providing the mass-manufactured suits of the modern office worker, the tailors of the Row prided themselves on their mastery of traditional handcrafts, the quality of their textiles, and their attention to the individualized needs of their customers. Savile Row firms also came to be associated with a particularly English "look": restrained, narrow shouldered with a long waist; though each company pioneered a subtly differentiated version of the Savile Row staple. Huntsman, for example, was known for their heavy tweed sporting jackets while Gieves provided a sleek naval cut. By the mid-twentieth century, tailors such as Davies, Kilgour, and Anderson & Sheppard pioneered a more glamorous version of Savile Row style through their fitting-out of fashion leaders such as the Duke of Windsor and Hollywood stars including Cary Grant and Fred Astaire. This greater attention to "fashion" was also marked by the presence of couturier Hardy Amies in the street from 1945. The Row had adapted following the decline of the British Empire from its role as Imperial outfitter to a new incarnation as the epitome of urbane sophistication. The final decades of the twentieth century saw further flowerings of talent on Savile Row. Echoing the explosion of boutique culture on Carnaby Street and the King's Road in the 1960s, Tommy Nutter and Rupert Lycett Green of Blades introduced the Row to styles that were well suited to the culture of Swinging London, a phenomenon brought to the heart of the Row by the arrival of the Beatles's management company, Apple, at number 3 in 1968. And in the 1990s and 2000s, the association of the Row with "cool" was reinforced once more by the innovations of a new generation of tailor/retailers, including Ozwald Boateng, Richard James, and Spencer Hart who attracted a younger, less hide-bound clientele to their bright and airy emporia. Thus, it can be seen that Savile Row has been highly adaptable to the vagaries of styles in clothing and social trends, maintaining its reputation for traditional manufacturing methods while subtly embracing the challenges of novelty. It is still the premier street in the world for male fashion aficionados. See also Boutique; Dandyism; London Fashion; Tailoring. Breward, Christopher. The Hidden Consumer: Masculinities, Fashion and City Life 1860-1914. Manchester, U.K.: Manchester University Press, 1999. --. Fashioning London: Clothing and the Modern Metropolis. New York: Berg Publishers, 2004. Chenoune, Farid. A History of Men's Fashion. Paris: Flammarion, 1992. Walker, Richard. 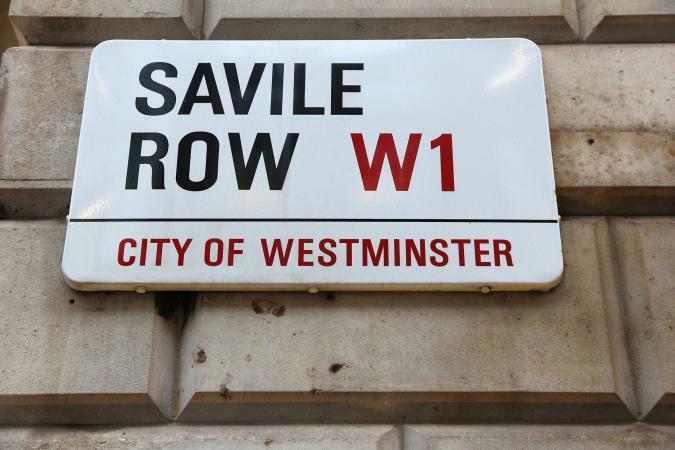 The Savile Row: An Illustrated History. New York: Rizzoli, 1989.